Our world changes January 20. How will you respond? For the next four years, the Forward will hold our elected officials accountable — to the U.S. constitution, to democratic principles, and to the values American Jews cherish — just as we’ve done since 1897. We’re going to continue publishing real journalism based on facts, not fear. And we’re going to help American Jews understand what President Trump’s decisions mean for them, every minute of every day, at Forward.com. Your donations power our reporting. Take a stand. Give today. This story "Inaugurate This!" was written by Rachel Fishman Feddersen. Publisher and CEO of the Forward, Feddersen has been an innovator in digital media since the earliest days of Silicon Alley. She is passionate about creating and supporting the most engaging media properties, and exploring new ways of reaching readers, wherever they may be. 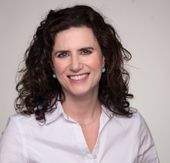 She has worked with audiences of many millions, as Chief Content Officer of Patch, with its 900 sites across the country; Digital GM at MentalFloss.comand TheWeek.com, thought-leading brands for millennials and global citizens; and editor-in-chief of Parenting.com.